Your child’s first loose tooth is a major life event and there’s plenty of reasons to get excited. It’s a huge first for your child and their first introduction to the Tooth Fairy, so the anticipation should be palpable, but many parents are still concerned about potential complications with loose teeth. Unless your child complains of extensive pain, swelling in their gums, or stops eating and brushing due to discomfort, there’s not much to worry about during the teething process. As a parent, the best thing you can do is to encourage your child to gently wiggle the tooth when it’s feeling loose and brush and eat as normally as possible. If they complain about discomfort, ibuprofen before bedtime is an acceptable treatment. Getting involved can lead to premature pulling that can cause bleeding, infection, and otherwise preventable pain. Pulling a loose tooth before it’s ready to come out on its own can break the root, leaving the gap more susceptible to infection and pooling bacteria. Loose teeth can take a few months to become loose enough to pull, but if a loose baby tooth remains in place for more than that, check with a dentist. If you find, however, that the tooth is extremely loose and ready to be pulled out (and your child is asking for help) here is one great method. While it’s always wise to seek the advice of a dental professional when it comes to your children’s teeth, the reality is that unless your child is experiencing worse-than-usual pain during the teething process, or has started to lose their teeth at a very early age (before 5 or 6), it likely is not necessary. Early teething may signify other underlying issues that should be monitored by a dentist. 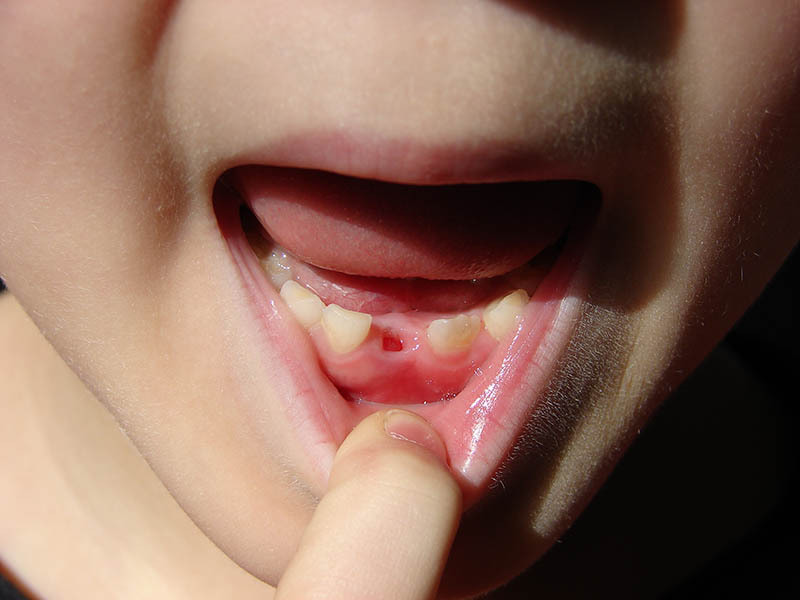 Some slight tenderness and redness may appear around the area the child has lost the tooth at first, but if it persists or causes any serious pain, contact your dentist. You can already see the permanent tooth coming in from underneath yet the baby tooth doesn’t look like it is loose yet. If your child has begun losing his or her teeth and their annual dentist visit is still a few months away, it may be a good idea to come into our office for a checkup. Contact Avila Dental to schedule an appointment or to learn more about caring for your child’s teeth as they get older. I am so glad that I came across this article! My son recently started to lose his baby teeth so I have been wondering if there is anything that I need to be aware of. My husband has been trying to yank them so I’ll be sure to tell him to avoid that. Thank you for the great info! I’ll ask my dentist any questions that I have.